It has been a busy couple of weeks and I haven't taken the time to post. I have been doing things like turning another year older, working on my taxes, which of course is not totally complete. I worked on my new website and as soon as it goes live it will be linked here. I have not been able to update my existing website with new work for way too long. 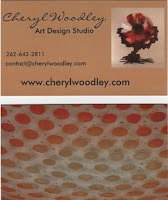 I have redesigned my business cards and had them printed by Zazzle.com . Love that website, they are super fast! Ordered my last set on Thursday night and they are set to be delivered the following Thursday. I was able to have a photo of one of my glass pieces on the entire back of the card. As soon as taxes are complete that will give me the time to get some metal plasma cut and welded up. Maybe the snow will be gone by then too.